(CelebrityAccess News Service) — Iron Maiden has just finished playing 28 shows to over 600,000 fans on the “Give me Ed…til I’m Dead” European tour and is about to embark on the North American leg of that tour. This is the first time the band has hit the States since 2000. After their forthcoming wave of US summer dates, a second European leg, called Dance of Death World Tour, will kick off in Prague on October 22, finishing in the UK just before Christmas. This tour will continue through mid-March, taking in South America, North America, Japan and other areas. Their upcoming July 30 concert at New York's Madison Square Garden sold out in five hours." 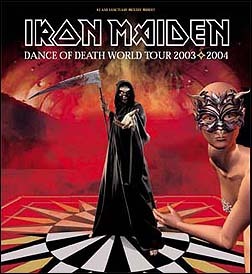 However, the Dance of Death World Tour will signal a change in how the band tours in the future as this will be the last long arena tour the band will undertake. While the band will continue recording and touring, manager Rod Smallwood says, “We want to explain this carefully and at length to our amazing fans so there is no confusion and because they deserve a full explanation. After Spring 2004, the band will not go out on the road for up to nine months touring with an album as we have up to now. As a progression from the scheduling around the Give Me Ed and Dance of Death tours, we will further break the album / tour cycle. Recording will be mainly in the winter (then releasing the album when it is ready and appropriate) and touring in the summer. We really enjoy the festivals and outdoor shows where Maiden fans congregate in numbers. There is a real atmosphere of community and this is something which really lifts the band. "Following the U.S Give Me Ed… dates this summer, we will announce a short major city arena run in America for early next year," Smallwood continues. "Extensive arena tours will then be a thing of the past. We know we have fans in many parts of the world who wish to see the band and we will try to spread out the shows as fairly as possible. Although tours will be shorter, we could in fact be playing live more regularly, which is something the band also like the idea of." Smallwood continues to explain, "We are announcing this up front to be fair to fans who live in the US cities we may not play in again – many of which are represented on this upcoming tour. We hope the fans understand and perhaps can come to see us somewhere else in future. It is our hope that if the band do pass through your city you will get the chance to see them perform an amazing Maiden gig. Smallwood notes that since managing Maiden in 1979, more than 1,700 gigs have been played in many, many parts of the World.